It may seem odd to see a post about ATVs on a beginner's dirt bike website, but not everyone can throw a leg over a dirt bike and ride off into the sunset. This isn't a dirt bike vs. ATV post - both machines have their place in the off-road world, but while dealing with manual shifting, clutching, and balancing may seem like fun to some people, it can be intimidating to others. An ATV might be an alternative for those who don't feel 100% comfortable riding a dirt bike. ATVs can offer off-road enthusiasts off-road and off-road experience, so when (or if) they're ready, they can segue to riding a dirt bike. There are two types of ATVs - sport quads and utility quads. Sport quads are fast, can handle some jumps, are usually two wheel drive, have manual transmissions (clutch and shifting), and are much lighter than the utility quads. The utility ATVs (aka utes) have automatic trannys (no clutch or shifting), are heavier, come in both two-wheel drive and four-wheel drive, have loads of storage space, full floorboards, a comfortable seat, and there are scores (if not hundreds) of attachments such as winches, snowplows, rack boxes, chainsaw holders, gun racks, etc., etc., etc.. Utility quads are more beginner-friendly than sports quads. Unlike dirt bikes, there are no longer any two stroke ATVs. The last two stroke quad was probably the long-running Yamaha Blaster which ceased production around 2006. Most ATV controls are fairly standardized, but some of the newer models have so many accessories that they're starting to look like airplane cockpits. Most basic ATVs have a thumb throttle, not a twist throttle like dirt bikes, and it's located on the right side of the handlebars. The left handlebar will probably have the electric start, headlight controller, a kill switch, and a lever that controls the front brake (where the clutch would be on a dirt bike). There is a foot-operated rear brake pedal on the right side floorboard. The gear shift lever is usually on the right side, (but Yamaha has theirs on the left) that has high, low, neutral, and reverse. The transmission is automatic so there is no clutch or shifting. 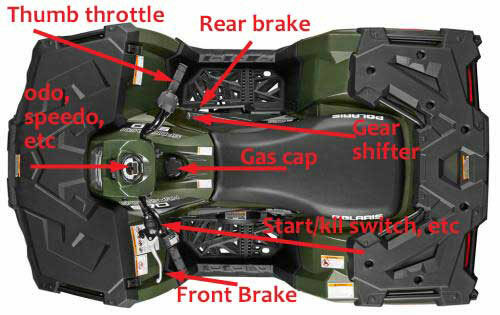 The image below shows the controls on the ATV handlebars. Two wheel drive, four wheel drive, clutchless shifting, EPS, IRS, EFI, and ESP. What does it all mean? (electronic power steering, independent rear suspension, electronic fuel injection, and electric shift program). Although most ATVs have a similar basic design, each manufacturer offers different options. Here are a few of the model names for some of the popular utility ATVs in case you want to do more research: Arctic Cat, CanAm/BRP Outlander, Honda Rancher, Kawasaki Brute Force, Polaris Sportsman, Suzuki King Quad, and Yamaha Grizzly. The image below shows the ATV controls on a Polaris Sportsman. Every State had different ATV regulations and that includes insurance requirements. For example, according to an Allstate article, residents of Pennsylvania are required to have insurance when they ride on public trails, (but it's not required if you ride on your own property). The only way to know if ATV insurance is required is ask the agency that oversees the area you're going to ride, whether it's privately owned or part of State land trails. If it's State land, chances are pretty good that the governmental agency in charge is going to require the ATV to be registered and carry insurance. Normally ATV insurance isn't very expensive, so having a basic ATV insurance policy might be worth the price just for peace of mind. Public trails are becoming more crowded, so the possibility of a collision with another rider is rising. ATVs are easy to ride, quiet, versatile, have lots of storage space, can be used around the house for many odd jobs, and you don't need to deal with a clutch or shifting gears. The downside is their instability on steeper hills, the need for more space to ride on, and they do more damage to the land than a dirt bike due to the heavier weight and wider tires. They're still loads of fun to ride and if learning to ride a dirt bike isn't working out as well as planned, riding an ATV is better than not spending time out on the trails at all. Many thousands of people ride quads all their lives and never have a bad accident, but that doesn't mean ATVs are foolproof. ATVs are much easier to ride than dirt bikes and can lull the rider into a false sense of security. Like any motor vehicle they can be dangerous, especially when it come to any kind of hills (uphill or down). If you lose your balance on a 215 pound dirt bike, the bike usually doesn't flip over and over going down the hill - it slides along with you. Compare that to a 550+ pound ATV with a much lower center of gravity and greater mass. The ATV tends to roll over and over, and if you're unlucky enough to get caught in the roll, you can be seriously injured, or maybe even killed. Always (always!) respect the machine. There are several websites that track ATV accident statistics and ATV deaths. Two of the sites are the ATV Safety Institute and ATV Safety.gov. This link shows the statistics for number of ATV deaths in each state, and this page has the ATV rules and regulations by state. Both sites also offer info about finding an ATV Rider Safety Course. Consider taking the ATV Safety Course or at the very least, stay away from hills when you first start riding. Oh yeah - you need to wear a helmet when riding an ATV. Really.